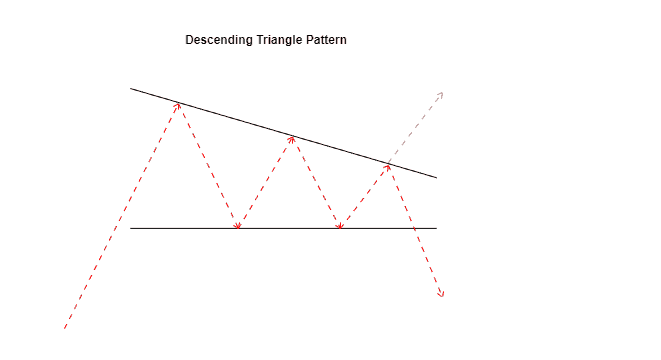 Descending triangle pattern is a type of chart pattern often used by technicians in price action trading. The descending triangle chart pattern forms at the end of a downtrend or after a correction to the downtrend. The descending triangle pattern is the opposite of the ascending triangle pattern. This pattern is known as the bearish triangle descending pattern. Chart technicians can make use of the descending triangle pattern in order to trade potential breakouts. Contrary to popular opinion, a descending triangle can be either bearish or bullish. Traditionally, a regular descending triangle pattern is considered to be a bearish chart pattern. However, a descending triangle pattern can also be bullish. In this instance it is known as a reversal pattern. Descending triangle stock pattern can be viewed as either a continuation pattern or a reversal pattern. The triangle continuation pattern is your typical bearish formation. This pattern occurs within an established downtrend. On the other hand, a descending triangle breakout in the opposite direction becomes a reversal pattern. A very important fact to bear in mind when trading the descending triangle is that, it is very subjective. 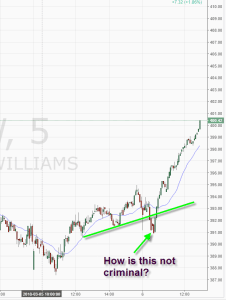 Therefore if you are new trading the descending triangle stock pattern, you need to have a lot of practice. Familiarizing oneself with the triangle pattern trading can allow the trade to build their own custom triangle trading strategies. The classic descending triangle pattern forms with a trend line that is sloping and a flat or a horizontal support line. The pattern emerges as price bounces off the support level at least twice. The descending triangle chart pattern occurs after the end of a retracement to a downtrend. 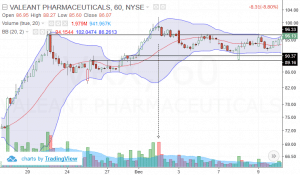 The downside breakout from the support triggers a strong bearish momentum led decline. However, this textbook pattern seldom occurs in the real markets. In most cases, a descending triangle pattern can also see a sloping base as well. Instead of a flat support level, you can see higher lows being formed. The illustration below shows an “ideal” descending triangle pattern and a more commonly occurring descending triangle pattern. Typically, the breakout from a descending triangle is triggered to the downside. The distance from the support to the first high is measured. This measured distance is then projected to the downside where the target price can be set. Not all descending triangles breakout to the downside. 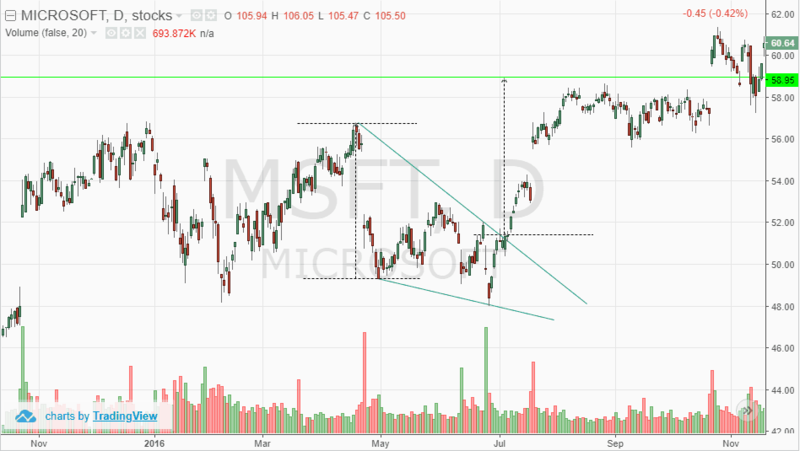 You can also see an upside breakout from the descending triangle. In this case, it becomes a continuation pattern instead of a reversal pattern. The same concept of measuring the distance from the support to the first high is used. This is then projected to the upside for the minimum price objective. In the next section of this article, we illustrate five descending triangle trading strategies that can be used. As the name suggests, the descending triangle pattern breakout strategy is very simple. It entails that the trader anticipates a breakout from the descending triangle pattern. This strategy uses a very simple combination of trading volumes and asserting the trend. The descending triangle pattern breakout can be used to capture short term profits. The first step in trading this strategy is to pick a stock that has been in a downtrend or in a consolidation phase. 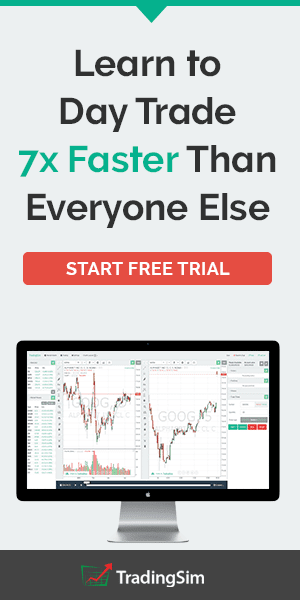 The time frame of the chart is irrelevant as you can use this strategy across any time period. Once you have identified a stock and the time frame wait for price action to consolidate. The trader needs to allow for some flexibility in charting the descending triangle patterns. Simply watch for lower highs and lower lows being formed. Once you have identified this price action, the next step is to draw or chart the descending triangle pattern. The basic premise of using this strategy is to look at volume once the triangle pattern has been observed. You can typically observe that volumes begin to fall toward the end of the descending triangle pattern formation. The chart below shows an example of the Microsoft (MSFT) daily stock chart. In the chart, you can see that the triangle pattern was formed after price action was trading sideways. After a brief spell, price falls lower before breaking out from the pattern. Volumes are usually lower closer to the breakout. Once you identify the lower volume, simply measure the distance from the first high and low. Then you simply project the same from the breakout area which becomes your target price. This simple volume based descending triangle pattern is easy to trade but requires lot of time to watch the charts. 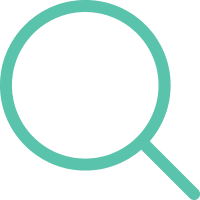 Using Heikin Ashi charts along with the descending triangle pattern you can develop a powerful but simple trading strategy. Heikin Ashi charts visually stand out compared to the conventional chart types. One of the main characteristic unique to Heikin Ashi charts is the fact that they can depict the trend easily. Most traders often struggle when it comes to identifying the trend. You can resolve this confusion by switching to Heikin Ashi charts. In this strategy, traders simply need to wait for the descending triangle pattern to be formed. Once the pattern has been identified, the next step is to wait for the bullish trend to pick up. In most cases, you will find that the Heikin Ashi candlesticks turn bullish prior to the breakout. This can be used as an initial signal to prepare for long positions in anticipation of a breakout. 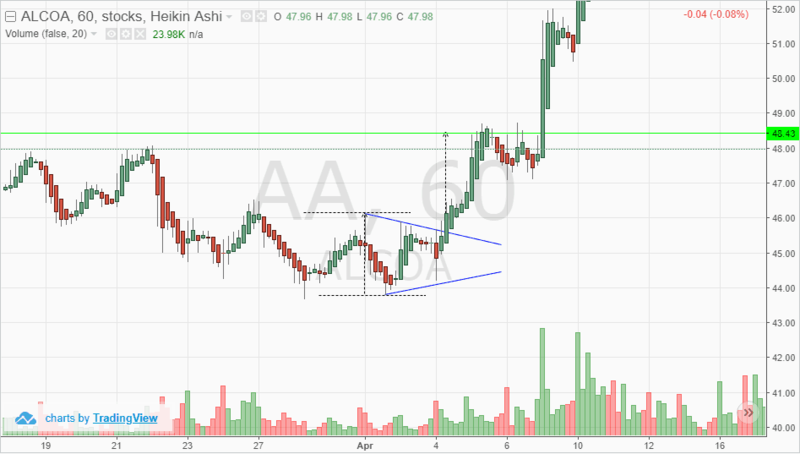 The next chart below shows the Heikin Ashi chart for Alcoa (AA) on the 60-minute time frame. You will see that prior to the breakout, the Heikin Ashi candlesticks turn bullish. The projections are based on the same strategy as before. Measure the distance from the first high to the first low and project the same from the anticipated breakout level. Wait for the breakout from the descending triangle pattern. Initiate a long position after the first bullish Heikin Ashi candlestick. Project the measured distance from the breakout to get the target price. 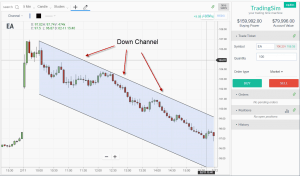 Depending on your charting platform, you will notice that volume bars also change. This is because they reflect the bullish/bearish sentiment based on the Heikin Ashi candlesticks. Volume bars serve an additional purpose to alert you to a potential bullish breakout. This descending triangle strategy with Heikin Ashi charts is effective to trade in the short term. 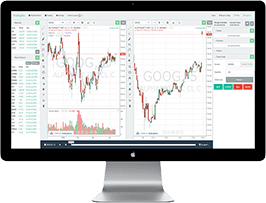 Traders and intraday speculators can also combing price action techniques and chart patterns with technical indicators. Moving averages, as one might know is one of the oldest and simplest of technical indicators to work with. In this descending triangle pattern strategy, we make use of the well known exponential moving average indicator. It is important to note that in this trading strategy, we use the descending triangle pattern to anticipate potential breakouts. The moving average indicators serve the purpose of triggering the signal to initiate a trade. 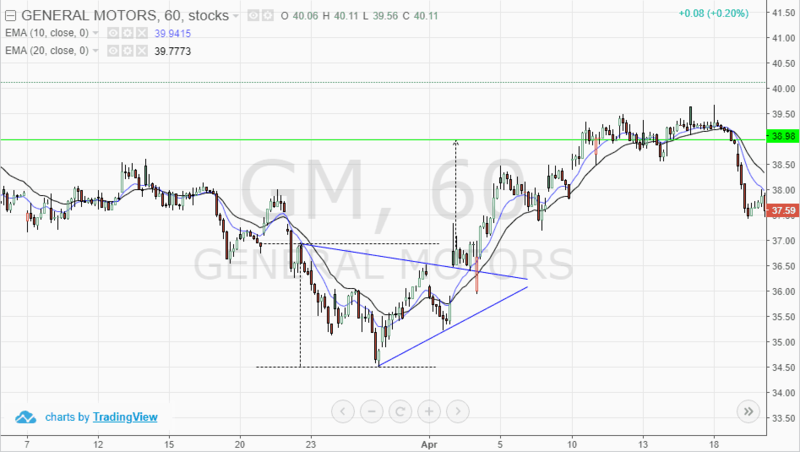 In the following example, we use a 60-minute stock chart for General Motors (GM). We use a 10 and 20 period exponential moving average. Traders can experiment with their own settings on the period of the moving average; this depends on the time period that you use. For example, for a daily chart time frame, you can use the 10, 20 or 20 and 50 period settings. Also note that using small periods (less than 10) could make your moving averages more sensitive to noise. The above chart shows the 10 and 20 period EMA applied to the chart for GM. Notice that prior to the break out the moving averages signal a buy. The moving averages can be a great source to alert you when to initiate a trade. There is no need to make use of volumes when trading with this strategy. Also note that you will not always see a bullish signal from the EMA’s prior to the breakout. After you get a bullish EMA signal and a breakout, it is an ideal signal to trade. Projections and target price level methods remains the same as outlined in the initial strategy. You can identify the descending triangle reversal pattern at the top end of the rally. This pattern emerges as volume declines and the stock fails to make fresh highs. The pattern indicates that the bullish momentum is exhausting. At the same time price action forms a horizontal support level. After price bounces off the support level multiple times, posting lower highs, we can anticipate a potential downside breakout. The minimum distance that price moves prior to the breakout is measured from the initial high. This distance is projected lower after price breaks out below the support level. The descending triangle reversal pattern can be very easy to trade if you spot the pattern ahead of the breakout. The next chart below illustrates the descending triangle reversal pattern in play. 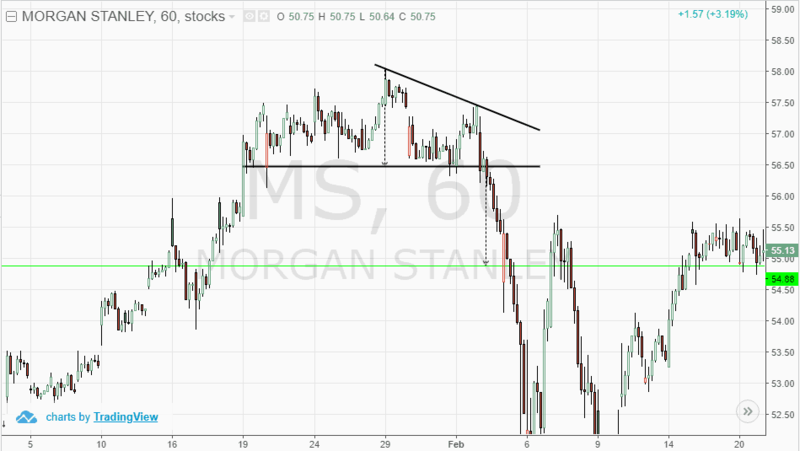 The stock chart for Morgan Stanley (MS) shows that after a strong rally, price stalls near the highs. Notice the support level that also stands out. The resulting bounce, off the support level leads to a lower high. Following this, price breaks down below the support with strong momentum. As you can see, the minimum measure distance is nothing but the project from the initial high. The descending triangle reversal pattern at the bottom end of a downtrend is the opposite. 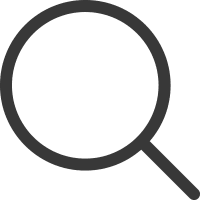 In this case, you will find that price action stalls at the end of a downtrend. A horizontal support level marks a bottom in price. Multiple attempts to the upside lead to lower highs. Subsequently price action eventually breakouts to the upside from the descending triangle reversal pattern at bottom. Unlike the strategy mentioned previously, in this set up, you can trade long positions. 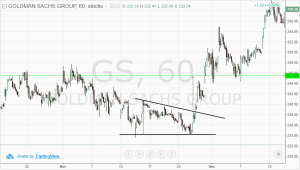 Traders can anticipate a potential upside breakout and trade the pattern accordingly. 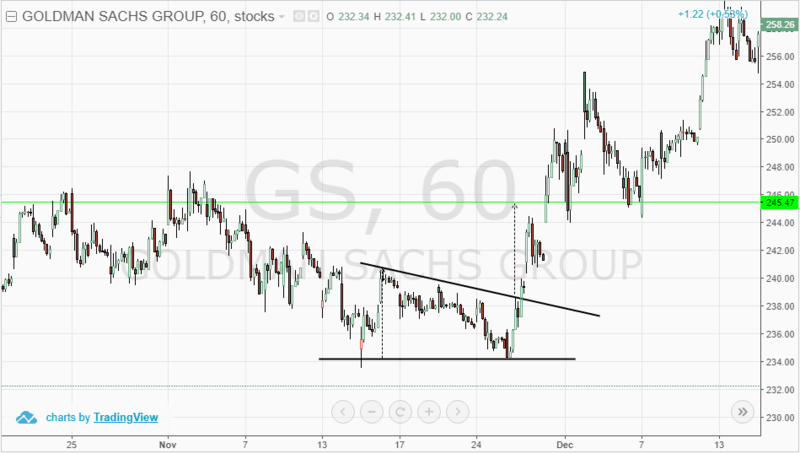 In the above chart set up for Goldman Sachs (GS), you can see how price fall to the lows establishing support. The horizontal support level holds the declines where the bounce off the support level leads to lower highs. Eventually, price action breakouts from the sloping trend line. Measure the distance from the horizontal support to the initial high and project this distance from the breakout level. The projected distance becomes your target price level. Subjectivity is essential when trading the descending triangle pattern. Traders who wait for the “classic” descending triangle pattern will often find themselves on the sidelines. Familiarity and experience are the best ways to trade with the descending triangle pattern. The descending triangle pattern is also know as a measured move chart pattern. A measured move chart pattern is when you measure the distance and project the same from a breakout. Many other trading strategies can blend well with the descending triangle chart pattern. It fits perfectly well within an investor’s buy and hold strategy. The triangle pattern also works with technical analysis which can complement the fundamental analysis as well. In conclusion, the descending triangle pattern is a versatile chart pattern which displays the distribution phase in the stock. Following a descending triangle pattern, the breakout is often swift led with momentum. This can lead to strong results when one becomes familiar with the trading strategies outlined.